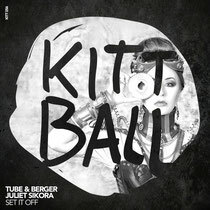 For their latest release, ‘Set It Off’, Tube & Berger are joined by the passionate Juliet Sikora whose role whether at the label, in the studio or in front of a crowd has made her an invaluable asset to the Kittball imprint. ‘Set It Off’ is a demonstration of the trio’s flair for creating depth within a production. Inspired by Strafe’s 1984 electro funk classic of the same name and spanning everything from retro-synths to techy elements the track is a true illustration of their wide musical compass, with an organic sounding guitar reflecting their early roots in punk music. Never ones to rest on their laurels, this cut is a further string to their bow, coming as it does at the tail end of Tuber & Berger’s best year to date with a momentum they will surely carry on into the next. it’s out 9 December on Kittball, check it out below.